Niklas Edin (Karlstad, Sweden) wins the Swiss Cup Basel, defeating Steffen Walstad (Oppdal, Norway) 7-5 at the Curling Center Region Basel in Arlesheim, Switzerland. Edin with Oskar Eriksson at third, Rasmus Wrana and Christoffer Sundgren on the front end take home the $18,287CDN first place cheque along with 53.834 world ranking points, while Walstad receives $9,143CDN and 39.478 world ranking points for their second place finish. Starting with hammer, Edin scored 1 in the first end to get on the board but Walstad responded in the second end scoring 2. After a blank end, Edin scored 4 in the fourth end to lead to 5-2, then forced Walstad to a single in the fifth end. 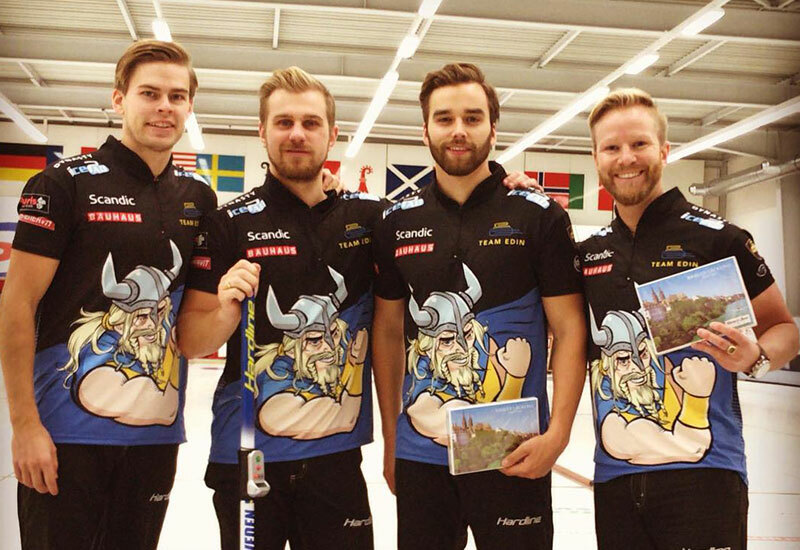 Edin scored 2 in the sixth end, with Walstad adding 2 of their own in the seventh end after which the Swedes ran Walstad out of stones in the eighth end for the 7-5 win. In the semifinals, Edin defeated Yannick Schwaller (Bern, Switzerland) 6-4 and Walstad defeated Peter De Cruz (Geneve, Switzerland) 5-3. De Cruz won $5,225CDN, while Schwaller won $3,919CDN along 28.711 ranking points for their semifinal finishes. In the quarterfinals, Edin defeated Sergio Vez (Vitoria-Gasteiz, Spain) 1-0, Walstad defeated Alexey Timofeev (Moscow, Russia) 3-1, while Schwaller defeated Bruce Mouat (Stirling, Scotland) 4-2 and De Cruz defeated Jaap van Dorp (Zoetermeer, Netherlands) 7-2. Vez, van Dorp, Timofeev and Mouat earned $2,612CDN along with 21.533 ranking points for their quarterfinal finishes. Edin went 4-0 in the 32 team triple knockout qualifying round. In their opening game, Edin defeated Klaudius Harsch (Fuessen, Germany) 7-5, then won against Lukas Klima (Prague, Czech Republic) 8-3, and Jan Hess (Zug, SUI) 6-5 to advance to the A-Qualifyig game where they defeated Thomas Ulsrud (Oslo, Norway) 5-3 to advance to the playoff round.